❶ Purchase of a bouquet blue inexpensively. Order a blue flower bouquet in Riga, Latvia. Purchase of a bouquet blue inexpensively. Order a blue flower bouquet in Riga, Latvia. An original blue bouquet of flowers will be a great gift for both women and men. You can order such a delightful composition at a bargain price in the best floristic studio in Riga and all over Latvia KROKUS. 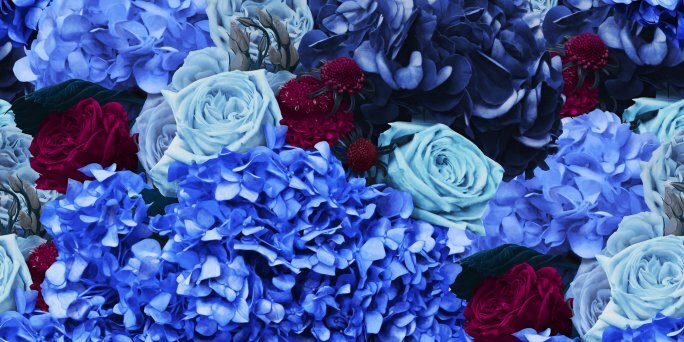 In the catalog of goods of our studio there are blue flower bouquet of hydrangeas, roses, orchids and other plants. You can arrange delivery of a navy blue bouquet to any corner of the country directly on the website of our online shop or by calling the operator of KROKUS by phone +371 200 303 06 at any time. Making a purchase of a delightful bouquet blue of flowers with delivery to the address in Riga or any other city of Latvia. KROKUS offers only fresh flowers and the most favorable prices. A bright and rich bouquet blue of flowers will be a welcome gift for a creative person and an extraordinary personality from Riga (Latvia). A unique arrangement is able to surprise and please your loved ones, cheer up, express the warmest and most sincere wishes. You can order a delightful blue bouquet of flowers at the most attractive price in Riga or any other city in Latvia, using the convenient online service of the best floristic online shop KROKUS. Order a blue orchid bouquet right now in our online studio! A royal blue bouquet is great as a present to a guy from Riga (Latvia). The rich colour of buds will emphasize masculinity and strength, effectively allocate the composition among other gifts. In this case a perfect solution will be to present a blue orchid bouquet to a man from Riga (Latvia) for birthday, name day, anniversary or any other holiday. Another, no less popular variant, will be a Riga blue rose bouquet from KROKUS. This arrangement is filled with a certain mystery, intrigue and romanticism. Only an unusual way of its delivery will be able to supplement such a unique gift. And KROKUS is happy to give its customers the opportunity to surprise the gifted. Order here an anonymous delivery to the address in Riga or another city in Latvia of a blue bouquet of flowers to arrange a mysterious and very pleasant surprise for a loved one. a purple and blue bouquet is an elegant accessory that will attract the attention of every guest at the wedding. previewing the bouquet before sending it and much more. We differ in a really individual approach to each client and are ready to help you to arrange an original surprise for a loved one, to make a pleasant and unforgettable gift that will leave the warmest and brightest impressions for a long time. Blue rose delivery to the address will undoubtedly surprise and impress the gifted! To make a purchase of a white and blue bouquet and other flower arrangements in Riga (Latvia) is very simple! It is enough to take advantage of the convenient functions of the official website of the company KROKUS. Choose the size of the bouquet you like, add it to the cart and pay for the goods in one of the available ways. After that, all the work on creating a beautiful flower masterpiece and its presentation to the gifted will be taken over by the specialists of the best online floristic shop in Riga and all Latvia KROKUS. If you are have difficulty making an online purchase, then feel free to call our manager at the specified number and apply in telephone mode.